In the new Western drama Yellowstone, Montana acts as the backdrop for century-old fights over what land means and who gets to claim it. John Dutton (Kevin Costner), owner of the Dutton Ranch, surrounded by his ranch team Walker (Ryan Bingham), Lloyd (Forrie Smith), Rip Wheeler (Cole Hauser), Jimmy (Jefferson White), Colby (Denim Richards), and Fred (Luke Peckinpah). In the opening episode of Yellowstone — whose two-hour premiere debuts tonight on the Paramount Network — there are plenty of phrases that will make a Montanan chuckle. In one of the first scenes, two lawyers (one the son of a rancher who owns the biggest ranch in Montana, the other representing the interests of a rich, oily developer) are fighting over the right to claim eminent domain to build a housing tract. That line tells us much of what we’re meant to know about Montana and its significance in the national imagination. Outside of Alaska, Montana is the closest the US gets to a last frontier — that mythical space where men (and they are almost always men) get to act out their fantasies and vanquish their anxieties. It’s a place where you go to seek the reverse of population density. It’s an antidote to urbanness, a place of open land — 147,040 square miles of it — but with just over 1 million people inhabiting it. It’s a place whose unofficial slogan is “The Last Best Place.” And in Yellowstone, the state of Montana becomes a tapestry on which to play out much larger questions concerning the future of land, ownership, and identity in the United States. Yellowstone is slicker, more staged, and more tightly plotted than real life. But that doesn’t mean that the tensions animating the heart of the show, and the anger, defensiveness, and ardor they induce, aren’t real. The story rotates around a Montana ranching family headed by John Dutton (Kevin Costner, appropriately face-tanned, wearing an unbelievably well-washed puffy jacket) and supported, in various ways, by his four children. There’s the dutiful eldest (Dave Annable), a cowboy who’s stayed on the ranch; the feminized lawyer (Wes Bentley), who you know is his father’s least loved because he wears a suit and slicks back his hair; the sexually voracious, ballbusting sister (Kelly Reilly); and the youngest, Kayce (Luke Grimes), most beloved because he’s the hottest and the best on a horse, but also because he’s turned the farthest away from his father, marrying a Native American woman and making his home on the (fictionalized) Broken Rock Reservation with their son. Yellowstone may be “about” Montana, but Montana is merely a convenient and suitably epic backdrop to consider the questions that undergird so many Western conversations: What’s the future of “traditional” ways of life? What do we do with all these new people? What authorizes someone to make decisions about the land — the time they’ve lived there, or the money and power they possess? Kevin Costner as ranch owner John Dutton. In the classic Western, a man went West to ratify his manhood by conquering the land and the Natives who lived there, all while fending off “civilizing” influences, whether in the form of women, religion, schooling, or fences. Even if you weren’t a frontiersman, you could read Louis L’Amour or watch My Darling Clementine and be assured that the robustness of American masculinity, and your place within it, was secure. Since the heyday of the classic Western, decades of so-called revisionist updates have highlighted the growing fragility of the US frontier as one of the nation’s foundational myths. From The Searchers to Unforgiven, the shifts in the Western genre reflected the loss of moral legibility that had come to afflict the nation as a whole. In recent years, the Western has continued to revise itself, arguably most prominently through the work of writer-director Taylor Sheridan, who is Yellowstone’s co-creator and director. Unlike most contemporary Westerns, which map contemporary anxieties onto the past, Sheridan fixates on present-day quasi-frontiers — places like rural Texas (Hell or High Water), Wyoming (Wind River), and now Montana, with narratives that engage the actual forces wreaking havoc on the so-called Western way of life: poverty, extraction industries, and sexual assault. Sheridan has been lauded for his treatment of Native American characters: Some appreciate his devotion to casting Natives in Native roles (a practice drawn into question with the casting of Kayce’s wife, Monica, played by Kelsey Asbille); Crow Nation chair A.J. Not Afraid, who permitted Sheridan to film on the Crow Reservation in Montana, praised Sheridan for refusing to reproduce tired Native stereotypes. But Wind River does descend into a common Western trope: It’s the white man (Jeremy Renner) assisted by a white woman (Elizabeth Olson) who ultimately get to be the heroes in a story where Natives primarily portray victims. In Yellowstone, it seems Sheridan has (somewhat) tried to rectify this shortcoming. 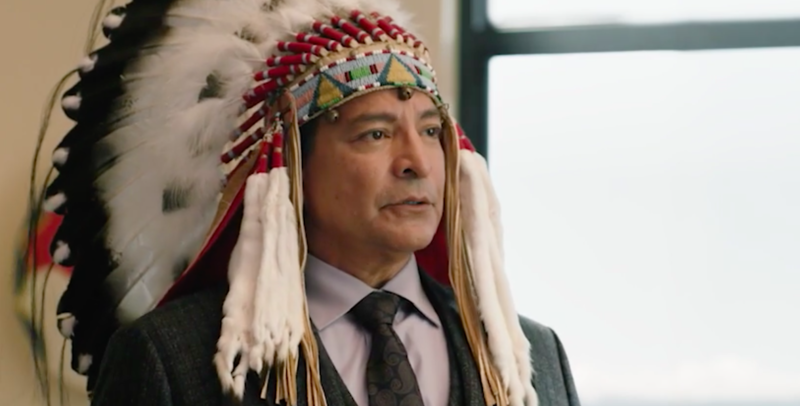 The show’s Native characters are still used as white character foils, but only sparingly — and one of Dutton’s two antagonists, the newly appointed chair of the Broken Rock Reservation, is afforded the sort of character complexity usually limited to white antiheroes. While the Dutton brothers offer up clichéd characterizations of life on the reservation (“You’d raise your kid in that meth desert?”), multiple scenes contradict their view. One in particular — in which Kayce’s wife, Monica, makes salad for dinner, along with her sister-in-law — might seem throwaway, but it’s the sort of mundane, family moment Natives are rarely granted onscreen. Yellowstone ostensibly centers on the Dutton family, but it’s nonetheless rooted in larger explorations of masculinity for all of its main characters — Native ones included. Yellowstone is about maintaining aging rancher masculinity as the world shifts around you, it’s about not-good-enough-son masculinity, it’s about the fallacies of stoic individualism and the masculine identity that serves as its foundation. But it’s also about different ways of being a Native man, and which sorts of actions and postures toward the past make a man a leader. As with most Westerns, there’s very little room for exploration of a woman’s role in the Western landscape, although it’s worth noting that the roles of a stern-faced senator and stern-faced governor are played by women (even though Montana has only elected one woman as governor and one woman to congressional office, and one of those was back in 1916). It’s hard to feel sympathy for the Duttons’ plight when their own claim to the land is rooted in forcefully and fatally pushing Natives off of it. “That don’t make no sense,” Kayce’s 5-year-old son responds. But for those in Montana, or any number of Western states, who’ve watched their populations rapidly increase over the last 20 years, it doesn’t have to. It just is. People want to live somewhere that has cleaner air and lower prices for larger houses, but with the same infrastructure and restaurants and grocery items and yoga offerings as the place they came from. They don’t actually want to live in Montana; they want to live where they live now, only with Montana views and Montana floor plans and Montana prices. Yellowstone gives voice to this conflict — between the sort of Montanans who love to put “fourth generation” behind their names when running for office and the type of people whose Montana home is a secondary residence — while juxtaposing it with a much older one: the conflict between the Natives who think of Montana not as a state, but as their ancestral home, and the white men who wrested more of their claim to that land with each generation. It’s hard to feel sympathy for the Duttons’ plight when their own claim to the land is rooted in forcefully and fatally pushing Natives off of it. 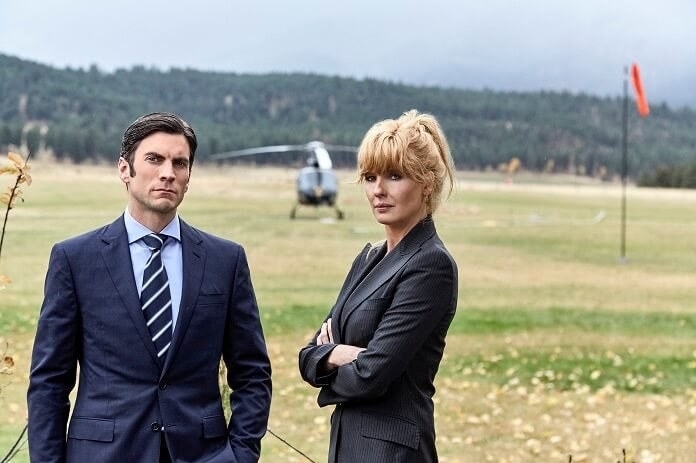 Citified siblings Jamie Dutton (Wes Bentley) and Beth Dutton (Kelly Reilly); Gil Birmingham as Broken Rock chair Thomas Rainwater. But then again, this isn’t just a Western; it’s also a melodrama, and a family melodrama at that. And like all family melodramas, it uses each member of the extended family (which, in this case, includes the Kayce’s extended family on the reservation, and the crew of cowboys “branded” in loyalty to Dutton) to act out larger societal conflicts. Sometimes, in order to make those conflicts legible, they have to be exaggerated. Dutton has to have four kids, for example, otherwise, you’d never understand their four different ways of seeing the Western world and how they contrast with his older, less tractable one. Yellowstone does something that so much prestige television refuses to: It takes contemporary Western issues, in all their myriad and complex forms, seriously. It’s easy to disdain this sort of broad narrative structuring — to call it, as critics already have, a Montana version of Dallas, which is often shorthand for “soapy” or “feminized” or “over the top,” all characterizations that have been used for over a century to denigrate the melodramatic form. Call it a Western, though, and you can recuperate it — particularly if you focus the marketing on a (straight white) man defending his place and identity in the world, and especially if you promote and fund it like “prestige” television. If the prestige and macho genre trappings get more people to watch Yellowstone, though, all the better. It’s by no means a perfect show — and I can only hope it encourages networks to fund more stories about the West created and written by Natives rather than white men — but Yellowstone does something that so much prestige television refuses to: It takes contemporary Western issues, in all their myriad and complex forms, seriously. It refuses, at least within the three episodes made available at press time, to offer anything approaching a neat or easy solution. There are no good or bad guys in Yellowstone (save the oily developer man) — no white or black hats, no easy delineation between noble Natives and well-meaning cowboys. Everyone’s broken and everyone’s angry, and everyone’s just hoping for the land to continue to offer them the sort of secure identity that’s increasingly impossible to find. “The state of Montana has never gauged its progress by the size of its cities,” Jamie Dutton argues in the opening court scene. “We measure our progress by how those cities impact the people and land surrounding them. The land that feeds them, provides their water, nourishes their souls.” Jamie claims to be distilling the essence of the Montana state constitution, but he could be summarizing the argument of rural America: that what happens in small towns and the spaces between them is just as valuable, just as effective a barometer for the health of the nation, as what happens in the city. So many of the rifts and divides in our nation hinge on that rural-urban divide, and while those tensions are as old as the Western itself, there’s very little art that attempts to address them. It’s refreshing to see a story that seriously explores what happens when even the “Last Best Place” ceases to value the small cities that have constituted its way of life — especially one that doesn’t simply focus on the white components of the answers it finds. Kayce Dutton (Lucas Grimes) and Monica Long (Kelsey Asbille). Pete (Pete Sands), Mo (Mo Brings Plenty), Thomas Rainwater (Gil Birmingham), Rip Wheeler (Cole Hauser), John Dutton (Kevin Costner), and Jamie Dutton (Wes Bentley).